Here at Bobcat Legends, I love to tell the history of our beloved Pixie-Bobs, or sometimes known as the mystery child of a legend. This wonderful breed was indeed a gift of nature. 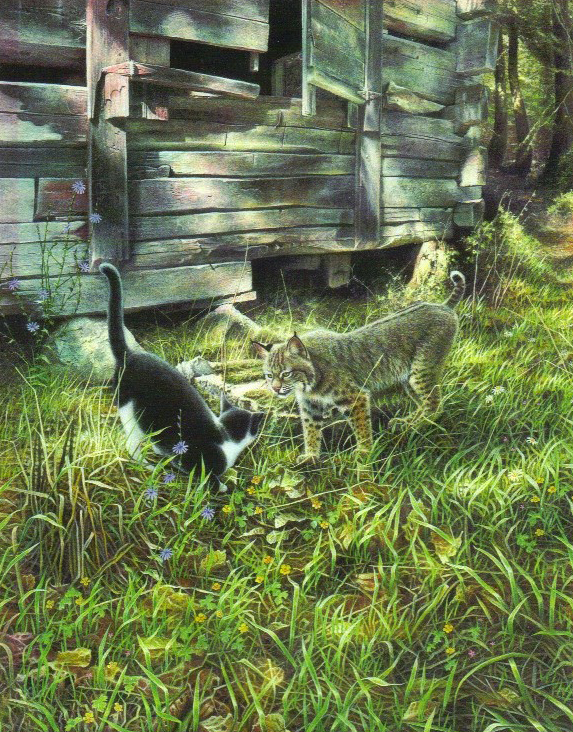 We believe that the first generation of this alleged breeding often goes unrecognized, and the kittens are usually wild in temperament, being un-socialized barn cats, but oddly, quite domestic in appearance. If a Bobcat (sire) breeds a domestic (queen), the kittens will as expected, physically resemble the mother, since we know that the queen contributes over 60% of the phenotype. Theory aside, science rejects the notion of a bobcat breeding with a domestic. Why? The negative DNA test results both from a full wild Bobcat, and a legend cat. Because there are 11 subspecies of Bobcat in the US, Canada, and Mexico, the kittens will vary greatly, depending upon the breed of female involved. The cats have been prized for generations by individuals who have kept them as unusually intelligent pets. It was in 1985 that this wonderful gift of nature occurred again with the shadow of the Cascade Mountains, near the shores of Puget Sound. A small coastal red Bobcat was seen fighting with a short-tailed polydactyl barn cat. The owner ran to save their cat from harm, and later reaped a harvest of kittens born through suspicious circumstances. A male polydactyl kitten was purchased by Carol Ann Brewer who was immediately intrigued with the kitten’s appearance and behavior. She knew she possessed a kitten with the blood of another world. This time it had fallen into the hands of a wonderful woman who believed their wild beauty, intelligence, and extreme pleasures should be enjoyed by all mankind. She began to search for information to help her understand the breed. Carol Ann discovered that there was indeed documentation by others who also believed that they had a cat with a wild heritage. According to what she read, it seemed that what had occurred there in the Pacific Northwest was not that unusual.